Finding the middle ground is important for a lot of things, and for a lot of reasons, including salary data. For example, when researching salary data, it’s important to know whether you’re looking at the mean, the mode, or the median. All three are measures of central tendency but they’re not all the same thing, much less the same number. Measures of central tendency are indicators of the center salary in a list of salaries. They represent the most typical value and they provide information about other points within the set of salary data. They help compensation professionals to make sense of the raw salary data but they do not, however, provide information about how dispersed the data are. The mode is the most frequently reported data point. To find the mode, organize the list of salaries by rank, lowest to highest. 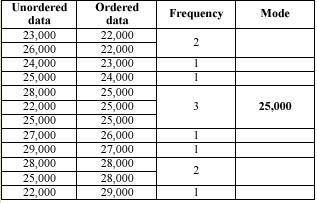 Next, count the number of times each data point is listed. The data point that is listed the most is the mode. Easy, right? But what if there are two data points that occur the most often? For example, instead of 29,000, that last salary amount was 28,000? When two amounts are represented equally, the data is bimodal. 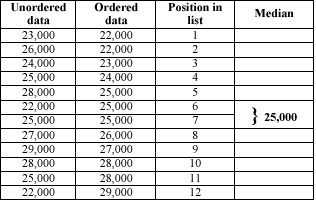 The median is the middle data point in an ordered list of salaries. It is the point at which, in an ordered distribution, an equal number of data points are above it as well as below it in the list. 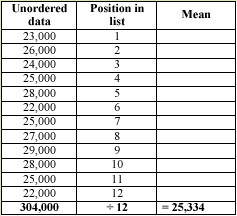 If the list has an even number of data points, and the two middle numbers are not the same, you split the difference to get the median amount for the data set. The simplest of the three, the mean, is the average of all the data points—the sum of all the data divided by the number of data points. Finding the mean does not require that the data be in an ordered list. Using the data charts shown above, the mode is 25,000, the median is 25,000, and the mean is 25,334. All very close to the same number but which is the right one to use when setting a salary range? In this case, any one of them is a valid mid-point for your salary range. If the list of data points included significant outliers, however, the mode or median might be the preferred choice for your mid-point. Generally, you’re not going to have so many data points when researching salary data but you should have 3 or more to insure adequate market representation when setting the mid-point of a salary range. A simple formula can be used to calculate the min and max for your salary range once the mid-point is determined.